Would you like to learn how to make stained glass on holiday in Cornwall? Well, painting holidays are all the rage – enjoy a holiday and improve your painting – so Jenny and I (Vitreus Art) decided late last year to set up a 5-day stained glass workshop in Cornwall. We’ve been consistently delighted by how many people sign up for our one-day classes. And we’ve always been surprised by the variety of folks that come along – young and old, male and female, artistic or just plain interested, well off folks for whom the £120 we charge is nothing, and people who have saved up – there’s no pattern, and we welcome you all! But who will come on our 5-day workshop? Well, we know they have the money – and time – to spend on something that is, frankly, an indulgence. We hope it will be a holiday too – although in October the weather in Porthleven, very near the furthest southerly point on mainland UK, won’t be summery! But what is a holiday? I’ve always thought of a holiday as a time to unwind from the strains of modern living, maybe leave the car alone for a few days, and the chance to switch my mind off from the routine. Oh, and I like to discover new things. What about you? We can certainly promise you that you’ll discover new things if you’re able to join us in October in Cornwall. We pride ourselves in creating a fun, inspiring, and creative environment on our one-day classes, and down in the Lifeboat House art studio that will be our venue, the group will be able to savour the salty air and ever-changing colours and light of the ocean – for the studio is right on the edge of the rocks in Porthleven Harbour. We’ve experienced the quality of the light one gets in West Cornwall to0 – the light that inspired Barbara Hepworth, Peter Lanyon, Ben Nicholson, and so many others. Indeed, the Tate St Ives and Newlyn art galleries are both about 20-30 minutes from our venue and we’ve allowed time to explore in the itinerary. After all – it’s a holiday! Time to unwind – it’s not all about stained glass! 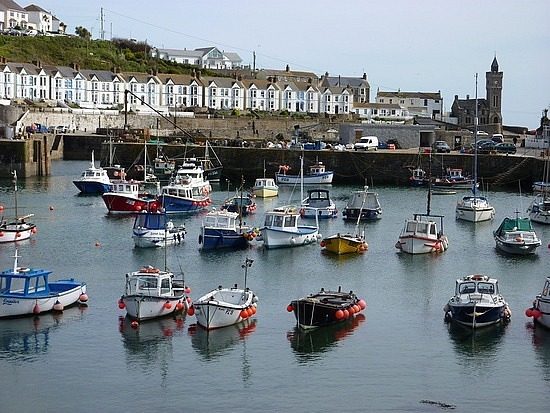 We’ve chosen Porthleven as our venue for some very good reasons! It has a good range of smart accomodation – a far cry from much of tourist Britain! It has some lovely restaurants – for all budgets and levels of formality. We know the area very well and can advise on things to do and places to go in the downtime. It’s a great place, with a sense of art and real life at every turn. It has the Ship Inn – my (Mike’s) favourite pub in the country! Oh – and it has the perfect venue in the Lifeboat House Art studio – converted from a lifeboat house (you guessed!). So if you want to learn to make stained glass (or improve skills you already have), have a break away from regular life, get some refreshing sea air in your lungs, enjoy fine food and nice pubs in a fascinating setting, we’d love to hear from you! Full details, including what we do on the workshop, where to stay, what there is to see and do nearby, plus info about the venue itself is all on the Vitreus Art website – link here. Do leave a comment or get in touch if you know this part of Cornwall – it’s special to us and we hope it will be to you too! Make your own silver jewellery with Precious Metal Clay – it’s like magic!